The most frequently asked questions I receive from readers relate to hand and nail care. For my nail polish posts I feature a mix of DIY and salon manicures. Finding a good salon and a reliable manicurist can take some time, then maintaining the nails with professional care can take up to 1 hour for a regular manicure so that requires additional time. Because I did so many polish reviews and swatches over the past years I could not afford to get regular manicures with the frequency of reviewing polish – both with the cost and time. I had to learn how to do it on my own so I observed the techniques of my favorite manicurists and practiced on my own. I will say that regular salon manicures and pedicures are 100% worth the splurge. Often times during high-stress periods in my life I found it impossible to shut off my mind and de-stress, even after work hours. Manicures kind of helped me stay sane because when someone is working on your hands you’re pretty much stuck doing nothing except for fun brainless tasks like reading magazines or listening to music or watching YouTube videos on your phone. It helped my brain go into hibernate mode so to speak. Also there’s something refreshing about having freshly groomed fingers or toes that makes you feel instantly alive and more put together. For hand and nail care I typically stick to a few tried and true items and it has been the case for several years. I did my Nail and Hand Care Essentials back in 2014 (wow time flies!) but many of you have asked for an updated post with a tutorial. I finally have one to share with you today and if you compare the posts you’ll see that not much has changed. A few notes for newbies. If your nails are not in the best state I would highly recommend getting them cleaned, cuticles trimmed and polished professionally. Doing something like a manicure once a month or every other week for a little while can help improve the look and health of your nails. I think they can work miracles! If you have any cracks, chipped nails, or problem areas, a manicurist can help smooth everything out nicely. Once they’re in a better state you can do touch ups or manicures at home in between professional manis. Up first are the tools then a DIY manicure tutorial of how I maintain and paint my fingers. Note that even after all this time of practice I can’t give myself a pedicure without it looking like I gooped a bunch of finger paint on my toes. I wish there was one brand or store where I could find all the best tools, unfortunately there is not. If you’re going to use my list as a shopping list for yourself, you will have to do a bit of shopping around. Most of the items I’ve bought can be found at Sephora, Ulta and Nordstrom (my 3 favorite beauty stores). Many of the items can also be found online at Amazon. If you’re shopping in store – check the online store locators to check inventory first. Often times I’ve gone to Ulta and found they were sold out of all the items on my list. They do restock frequently but to save time it’s best to research online and make a list first if you’re going to go out to multiple stores. As usual I’ve linked all the products to where I’ve bought the items in the past. Revlon Nail Clippers – these are an older style, I can’t remember how long ago I bought these, the current versions have an embossed pattern on the surface, to clip nails I recommend clipping about 1/2 to 1/4 of what you think you need to trim. It’s better to do it in stages and then clip more. My biggest challenge was over-clipping. Nail files – I usually accumulate cheap ones here and there, I’m not brand loyal to any particular type. Ulta Beauty Crystal Nail File is no longer available online but you can find one from the Sephora Collection that is only $10. These are great for those with sensitive nails, there’s no grit texture like with traditional files so it’s more gentle on the nails. Deborah Lippman Cuticle Remover is what I call my secret weapon for nails. It softens the cuticle area so you can push back any excess skin to trim them. This is an essential in my routine. I don’t know if she changed the packaging – I’ve seen a few in stores with a brush applicator instead of the dropper. Tweezerman Cuticle Nipper is what I use to trim cuticles, it fits well in the hands and does the job well, mine has lasted since 2014, I do need to replace it soon though. Face It Pro Salon Nail Pusher is something I bought at a local Korean Supermarket (Zion Marketplace in San Diego), I have super tiny fingers so this one is a bit large for my hands but still works, I like the shape of the tools and quality. Tweezerman Pushy Nail and Cuticle Cleaner has been my go-to tool to push back the cuticle area and keep fingers looking groomed. Also available at Amazon for a cheaper price. Not shown above, but there was a limited-edition Zwilling Manicure Set my husband uses and loves, this has been discontinued but he likes the quality of their tools if you’re looking for items for your man. My absolute favorite base and top coats have now been discontinued (Deborah Lippmann Rehydrating Base Coat, Formula X Base Coat, Chanel Brilliance Top Coat and all the items from Rescue Beauty Lounge). I have still found some others that I really like. Nails Inc. 45 Second Top Coat with Kensington Caviar is a great top coat that doesn’t have any shrinkage with polishes like Chanel, Dior or Tom Ford. Mine lasted about 2.5 years before it got thick and I had to throw it out. It lasted me so long because I rotate top coat brands. This one does dry within 45 seconds – just make sure your polish coats have properly dried first before applying. This gives the nails a super glossy cushiony look. Nails Inc. base coats I’ve tired include the Nailkale Superfood Base Coat and the Base Coat with Kensington Caviar. I prefer the Nailkale Superfood Base Coat because it’s nourishing and doesn’t tint the nails. It has kale to strengthen the nails and keratin to help harden and stimulate growth. This is what I attribute to having healthy looking nails. With base coats I think it’s important to not apply too much – if it’s too thick it doesn’t dry properly and then polish on top just sits there. The Base Coat with Kensington Caviar has been a long-time go-to as well, but it can get a bit thick with age and it also can tint the nails pink. Formula X Base Coat has been my favorite for a long time. Unfortunately it looks like the line has been pulled from Sephora. If you visit your store you may see a bunch of items on clearance. So stock up if you see any favorites there. CND has been a long-time favorite. One of my salons used both the Stickey Base Coat and Super Shiny top Coat. They’re reliable staples and I highly recommend both. Seche Vite Dry Fast Top Coat has never really been a favorite because it has major shrinkage with brands like Chanel, Dior, Tom Ford, YSL and pretty much all the brands I use. It does work well with OPI, Essie and Louboutin though and since it dries quickly I like the way it works and looks. Your mileage may vary depending on what polish you use. If you find that Chanel or Dior gets really quick tip wear on you, check what top coat you’re using. Some formulas are not compatible with 5 free formulas and cause shrinkage which pulls back the polish from the ends like tips or cuticles. Chanel Le Gel Coat is a newer top coat that Chanel launched. It wears really well and gives the nails a cushiony shine. I love this with Chanel polishes and it also works well with Dior. Louboutin Loubi Primer and Loubi Gloss is one of the best nail care duos I’ve used. The price point is high and this comes as a duo. The primer keeps nails from yellowing and helps to hydrate them well. The top coat gives one of the best high-gloss shines I’ve ever seen and keeps polish lasting long for up to 7 days for me. It’s not the fastest drying duo but well worth the extra time it takes. L’Occitane makes some of my favorite hand creams, they’re great for dry skin and I love the fun packaging. For those with sensitive noses the Shea Butter is the best and most gentle. It has a very natural smelling scent that is soothing. 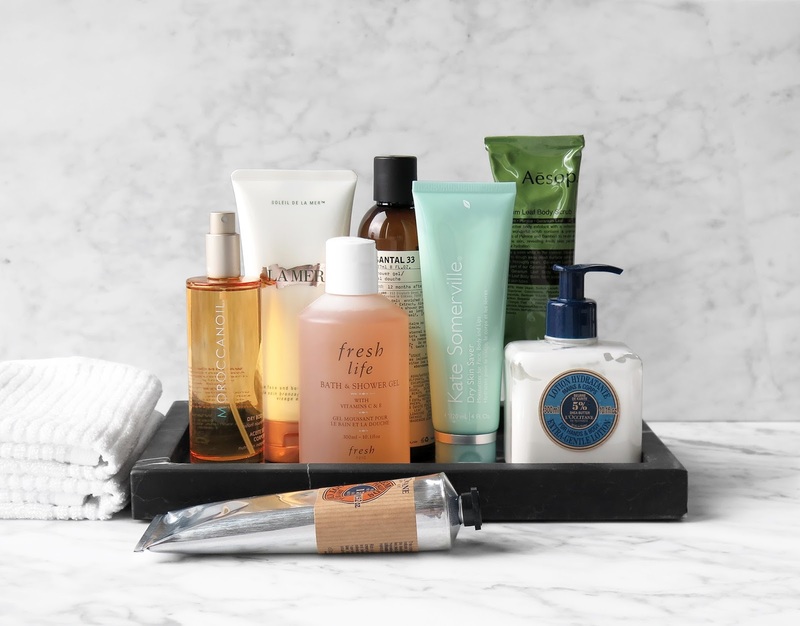 Molton Brown makes my favorite scented hand creams, they have a lightweight texture so they’re not greasy and I love their scents. Pink Pepperpod and Coco Sandalwood are my favorites but really all the options are great. Kiehl’s introduced scented hand creams in a Limited-Edition Trio this year, you can buy them separately in a larger size, but the minis are exclusive to Neiman Marcus (while supplies last). The Kiehl’s Ultimate Strength Hand Salve is the unscented version and I also really like it. I don’t have one at the moment because my husband uses it as well and we go through them frequently. Molton Brown Alba White Truffle Hand Treatment and Scrub are amazing for a hand cream and scrub. I’ve written about this duo before and absolutely love it. I’ve never done a hand scrub before trying this. Over the holidays a year ago many of you mentioned you do regular hand scrubs and that it works wonders on your hands. Deborah Lippman Cuticle Oil has been my go-to for years. I’ve gone through several bottles and love it. Dior Huile Abricot was interesting to me because it seemed to be less messy and easier to apply compared to most oils. It’s a great touch up for the cuticles and is super hydrating without getting messy. I really like it. Two polish removers I swear by are Deborah Lippmann The Stripper and Zoya Remove +. If you find your nails peel it may be because you’re using harsh polish removers. Both of these are super gentle and good for sensitive nails. Amy from Cafe Makeup recommended the Zoya remover to me years ago and as her nails always look pristine I took her advice and am forever grateful for this discovery. Chanel Le Coton is one of my favorite facial cottons, it’s bit spendy to use for polish remover but it soaks up a lot so you can use one square for one hand for lighter polishes. Facial Cotton review and comparison here. Sephora Collection Cotton Rounds are great because they’re cheap and don’t leave fibers behind which can be super annoying when you need to get the nail surface completely clean. Love these and have have lost count of how many times I’ve ordered these. Step 2 is optional, let the fingers soak with warm water and bit of hand soap to soften the cuticles. I absolutely love the Molton Brown Hand Washes – they smell amazing, don’t dry out the skin and I love the packaging. A few personal notes on nail care. I’m not a manicurist or nail professional but based on my experience I think the only way to avoid breakage is to keep nails on the shorter side. I do believe there are a lot of nail strengtheners and sometimes nail hardness depends on diet and health, but no matter what I do I can’t avoid breakage when they get long. For me playing frisbee always breaks my nails. On tip wear your mileage will vary depending on hand activity and nail length. The longer the nails the easier it is for the tips to come in contact with things like a keyboard or anything else you touch and therefore they get more wear than shorter nails. If you have broken chips, hang nails, cuts or any issue I highly recommend that you try to get them fixed by a professional manicurist – the few visits to get them to a healthy state is well worth the splurge. Also depending on hand or foot activities a salon can work wonders. I did ballet from the time I was 7 years old until 18 and my feet were badly calloused for years. I didn’t think there was anything I could do to get them fixed to a normal state. I did not get my first mani or pedi until I was 21 and was amazed at how much it improved my feet. It took about a year of regular pedicures every other week or so to get them into a presentable state. Also a note on gel nails, I’ve never had my nails with gels so I can’t give any advice or input on those. An extra step that I just started doing is masking my hands. I used on a few occasions the Glamglow Thirsty Mud Mask and SK-II Facial Treatment Mask on hands and afterwards it was like years had been lifted. I don’t know that I have the patience to do this on a regular basis but on super dry skin days with the dry weather this helped a lot. I hope you found this roundup helpful! With nail care there are so many options to try – the fancy packaging and pretty bottles are always so tempting at the store. I get overwhelmed at Ulta and whip out my phone to look for online reviews, realize it’s going to take too much time to research and end up sticking with what I’ve tried and loved. If you have any favorites, tips or tricks please share in the comments! My advice is practice makes perfect! It does take time and there were many times in the beginning I just gave up and ended up going to my salon because it would be faster and more efficient for them to take 40 minutes to an hour to do them rather than try to finish myself. I gave up many many times. Eventually I got better and can do both hands easily at home on my own. I still get professional manicures when time allows. I would say over the past year for reference that the vast majority of the nail polish reviews I did were done on my own. Ballpark figure is over 80% of the nail swatches were done on my own. Press samples include the Molton Brown Alba White Truffle duo and Louboutin Loubi Nail Kit.